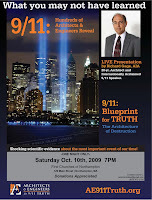 Professional architect Richard Gage, AIA, founder of Architects & Engineers for 9/11 Truth, will be appearing in the Sanctuary of First Churches in Northampton, MA on Saturday, October 10th at 7pm to deliver his provocative multimedia presentation about the laws of physics and how they relate to architectural standards and observable phenomena on 9/11/01. There will be a question and answer session following the presentation. In addition to the general public, professionals in the architectural, construction and engineering trades are strongly encouraged to attend. Mr. Gage's presentation systematically explores the physical and videographic evidence that has led him to conclude, based on his training as an architect and experience designing high-rise steel-framed office buildings and other large commercial structures, that only a systematic demolition program involving preplanted explosives of some kind could have produced the free-fall collapse speeds, pools of molten metal that persisted for many weeks, and the complete disintegration of the buildings into rapidly-expanding superheated clouds of sub-micron dust. The events of 9/11/01 have been used as the rationale for the so-called Global War on Terror and two invasions/occupations of foreign countries, as well as widespread curtailment of U.S. civil liberties and a program of officially-sanctioned torture. The actual evidence, however, if one dares to look, suggests that the official story of the building "collapses" is completely false and argues for a new, independent investigation of the crimes of that day. Many people do not even realize that a third skyscraper (WTC 7), which was forty-seven stories tall (half the size of the twin towers but the largest building in 38 U.S. states), collapsed on that fateful day. The event is presented free of charge. A basket will be passed during the program to help defray expenses. More information about Richard Gage and Architects and Engineers for 9/11 Truth can be found at http://www.ae911truth.org/. in association with Positronic Design of Holyoke, MA. Click here for a full size poster.